CO2, water, and CH4 (methane) and some other minor gases are so-called “greenhouse gases” because they absorb infrared energy. However, be careful to avoid the common misunderstanding that the earth and its atmosphere behave like a garden greenhouse; that is not true. Greenhouses are closed systems except to incoming energy. Earth is an open system, open to receive energy, as well receive gases and other matter from space and also open to transmit energy, gases and matter back into space. A greenhouse is a poor analogy for earth’s climate. Greenhouse gases also re-emit almost instantly the energy they absorbed, emitting that energy at a slightly lower energy than which it was absorbed. Rarely is that emission mentioned in the news or by climate alarmists. Proponents of global warming want you to believe that energy is stored and builds up in the atmosphere in a sort of hothouse or pressure cooker, but that is not true. In most locations, the concentration of water vapor (including clouds) in the atmosphere is far higher than CO2 and methane, that is, there are far more water vapor molecules in a given volume of air than there are CO2 or methane. Near the equator and bodies of water, swamps and tundra water vapor in atmosphere will be near 100% relative humidity. That is, the air is saturated, no more water vapor can be added to the air at that temperature and air pressure. Water vapor in air is found in the range of 0% to 100% relative humidity. Cold air holds very little water vapor. The air at the poles is usually very dry. Warm air holds much water vapor. Air in the tropics is usually humid. The tropics and sub-tropics receive large amounts of solar irradiation during the day, but none at night. During the day, the surface of ocean water is warmed by solar radiation and that warmth results in release of large amounts of CO2 and CH4 as well as water vapor into the atmosphere; the amount of these released gases dwarfs all contributions of these gases by humans. At night, the cooler ocean surface absorbs large amounts of CO2. CO2 is very soluble in cold water. The oceans and subsea floor hold far more methane (CH4) than all petroleum and fossil fuels ever discovered, and this methane is continuously degassed out of warm water and soil into the air. CH4 released into open air spontaneously converts (oxidizes) to CO2 and water at standard temperature and pressure. CH4 + 2 O2 -> CO2 + 2 H2O + a small amount of energy. Almost all CH4 originated as living cells. The cells died, entered the soil, rivers, lakes and ocean as runoff, metabolized and degraded by natural biological activity; this is the ultimate source of almost all fossil fuel on earth. That natural resource is continuously renewing and unlikely to be exhausted so long as there is life in the oceans. Water vapor is the dominate greenhouse gas, absorbing by far both more direct solar energy and indirect solar energy re-emitted by the earth. More than 70% of the earth is covered with liquid water and about 40% of the earth and liquid water is receiving direct solar radiation every day. Additional liquid water is on land and in soil and plants. Solar radiation increases the molecular activity of liquid water molecules until they can no longer be held by the surface tension of the water. These active water molecules evaporate, i.e. release energetic water molecules, to become gaseous water vapor in the atmosphere. This release of energetic molecules cools the surface of the water, not warm the water, they just left. Your skin is cooled when your sweat evaporates. Liquid water is far denser than air. Dense liquid water in the oceans is a huge reservoir of stored energy. The oceans contain greater than 1000 times more energy than the atmosphere; this means that earth’s atmosphere as a whole – regardless which gases make up the atmosphere – cannot warm the oceans in any significant amount. And this means the oceans are warming the atmosphere. The oceans are controlling the weather and climate on earth, not the atmosphere. The oceans are warmed by direct and indirect solar radiation as well as volcanic and tectonic forces resulting from gravity. The specific gas molecules (nitrogen, oxygen, water vapor, as well as CO2, methane, and several other trace gases) that make up the atmosphere, each with their various concentrations, individually or in combination, are irrelevant to the long-term average temperature of the planet. In other words, an atmosphere of 100% CO2 could not significantly change the earth’s average temperature; instead, the ocean with its huge heat content would control the temperature of the 100% CO2 atmosphere. The atmosphere cannot warm significantly the earth over an extended time period, such as a year. But a warm ocean current, such as an El Nino, can change our climate and weather overnight. However, water vapor and CO2 cause relatively minor temperature changes of the atmosphere at the surface (troposphere.) Water vapor and CO2 delay the release of energy from the earth into outer space, and this is most evident at night. Night time air temperatures at earth’s surface would be significantly cooler without water vapor and CO2. In a sense, greenhouse gases act as a nighttime insulator for the earth. The effects of this are clearly seen at night. In warm, humid climates like New Orleans, the warmth of the air is retained late into the night, finally cooling by morning. Water vapor and CO2 do that. In dry desert or arctic areas, the warmth of the day very rapidly is re-radiated into outer space and nighttime temperatures plunge rapidly. The absence of water vapor and CO2 do that. CO2 has the same effect as water vapor/humidity except in far less amount than water vapor/humidity. CH4 is even less than CO2. Nitrogen (78%), oxygen (21%) are the primary gases in the atmosphere, but these gases are mostly transparent to direct incoming solar radiation. Transparent means there are very limited or no energy bands available in these gaseous molecules to absorb energy at the wavelengths of the incoming solar radiation. A significantly large amount of solar energy is reflected by earth’s clouds, land and water surfaces back into outer space; this effect is known as albedo. The other atmospheric gases in total comprise about 1% of the atmosphere; this 1% includes water vapor, the inert gases (mostly argon which makes up 0.93%) and the trace gases. Carbon dioxide, methane and all other trace gases combined make up only about 0.04% of air. Most radiant energy of the sun is transmitted through the gases in the atmosphere to the surface, i.e. to water and land surface, where it is absorbed. Most solar radiation is in the higher energy infrared, visible and ultraviolent wavelengths. Visible light, UV, X-Ray, and gamma radiation are all higher energy (higher frequency/shorter wavelength) than IR. Water vapor absorbs at certain visible energy bands…so we see darkening clouds as water vapor concentration increases. Solar radiation is absorbed by the molecules at the surface of water and land and then is spread through conduction and convection and dissipated in the energy cascade in the molecules of the water or solid matter. Some energy is re-emitted from the surface of land and water into the atmosphere but at lower energy, longer wavelengths, lower frequency than which it was originally absorbed. Solar radiation received by the earth is known as Total Solar Irradiance (TSI). TSI has a cycle involving multiple variables which I will not go into here except to point out that climate cycles on earth correlate well with the TSI cycle and also with ocean temperature cycles known as PDO. Temperature does not track CO2 very well (figure 11 below). Note temperature is flat, increasing, declining, and increasing while CO2 is increasing. Statistical correlation is weak. Over longer time periods, the correlation between CO2 and temperature is very poor. The two trends are widely diverging as seen in the graphic below. If the global warming hypothesis were valid, these two trends would be parallel or converging. For the remainder of this discussion, I will consider only energy in the infrared (IR) wavelengths. Molecules in water and land absorb IR at several discrete higher energy/shorter IR wavelengths that match discrete energy bands of the electrons of each molecule. If the incoming energy does not match an energy band of the molecule, or if that energy band is not available to absorb because the band is already occupied with energy, then the energy passes through the molecule without being absorbed. If the IR energy is absorbed, then in a fraction of a second, part of that energy is dissipated as kinetic energy (various motions such as stretching, bending, and vibrations internal to the molecule or collisions with other molecules) leaving slightly lower energy/slightly longer wavelength/slightly lower frequency IR energy. That lower energy is then re-emitted. Since part of the energy has already been dissipated internally by the molecule, the emission has a longer wavelength, lower frequency of IR than the IR that was originally absorbed. Energy is not stored in a molecule except in the macro sense of all molecules taken together, and then only temporarily while the energy is progressively dissipated. Energy moves from one molecule to the next and at each step the energy is reduced. By this process, IR energy is absorbed by a water vapor, or CO2 molecule, or CH4 molecule for only fraction of a second and then re-emitted at a longer wavelength (lower frequency, lower energy, cooler). This cascade continues progressively downward in the energy until eventually the remaining energy is dissipated as kinetic energy by collision with other molecules, or various internal molecular motions. IR radiation is a sub-spectrum within the overall solar radiation spectrum. IR is 49.4% of solar energy reaching the outer atmosphere of earth. H2O, CO2, and CH4 absorb IR radiation ONLY at specific, discrete wavelengths (or quanta, or energy bands). Other wavelengths, which include most down-dwelling IR radiation directly from the sun, pass transparently through the molecules. Water vapor does absorb some incoming direct IR radiation. Some H2O, CO2, CH4 absorption wavelengths overlap (see graphic Figure 5-2), that is, these three molecules absorb IR at some of the same discrete wavelengths. This means that the gas which has the highest concentration in air absorbs and re-emits the most IR radiation. On average, water vapor including clouds is the highest concentration among the greenhouse gases, and thereby water vapor including clouds is the dominant greenhouse gas. Most direct solar IR passes through air molecules to interact with molecules on the surface of water or land. Thus, infrared radiation is largely responsible for warming Earth’s surface, both land and water. In other words, the sun is not DIRECTLY warming the atmosphere, but INDIRECTLY warming the atmosphere. Most solar energy is absorbed in the molecules of the ocean and land which in turn warm the atmosphere. Most greenhouse warming is caused by reflected IR and IR emitted after dissipation from higher energy visible and UV energy. We don’t perceive visible light as heat; but when visible light interacts with matter, unless reflected, its energy is dissipated step by step in the downward energy cascade as described above until it becomes longer wavelength IR which then we perceive as heat. Re-radiation, conduction and convection from the surface of water and land warms the atmosphere. IR energy only penetrates a few meters beneath the surface in liquid water in the oceans and lakes, while visible light transmits many meters beneath the surface of water, progressively loosing its colors from red to eventually higher energy blue and finally no visible light at increasing depth. The higher energy, shorter wavelength, higher frequency UV, x-ray and gamma energy mostly transmits through liquid water and finally interacts with molecules in solid matter in land or sea floor, or minimally with inorganic molecules dissolved in ocean water. Molecules on land and the seafloor surface are irradiated by these higher energy wavelengths, absorbing this energy, or conducting it further, and then these molecules progressively dissipate their energy as described above to progressively longer wavelengths and lower energy, eventually to IR wavelengths. The energy cascade continues on down the energy spectrum to satellite, wireless, radio, TV, MRI wavelengths and finally dissipated as kinetic motion of the molecule itself or collision. The earth and the atmosphere also reflect and emit energy back into outer space, mostly in the visible and IR bands. IR emission from the atmosphere, water and land into outer space occurs day and night and is measured by satellite. Earth is an open system, continuously re-radiating its energy (which originally came from the sun) back into outer space, that is, radiating from higher energy earth to the much lower energy outer space beyond our atmosphere. The fact that earth’s temperature is relatively stable over long periods of time, millions of years in multiple geological periods, implies that there is a balance between incoming energy and outgoing energy. I won’t go further into this energy balance topic here. Over the very long time period of millions of years leading to the present, the earth has been in a slow cooling trend and has had a slowly declining atmospheric CO2 concentration as indicated in these graphics; this is probably contrary to what you have been told and taught. On the other hand, and probably what you have been taught, in the geological short term, that is since the Little Ice Age and Industrial Revolution, earth warmed and total CO2 concentration increased. However most of that warming occurred before the 1950’s and that period was prior to the highest CO2 emissions by humans due to use of fossil fuels. In other words, the warming that followed the end of the Little Ice Age had very low CO2 concentration, thus that CO2 could not have caused the warming that occurred. The warming that occurred since the end of the Little Ice Age is within the statistical variation of the much longer-term cooling trend. In geological terms, since there is year-round ice at both poles, our present period is part of an interglacial period within an ice age. There has been global warming during our lifetime, mostly occurring before the 1950’s, but this warming is not unprecedented. And there has also been global cooling during our lifetime, also not unprecedented. Returning to our “greenhouse gases,” the takeaway point is, again, the sun heats the earth, then the earth heats the atmosphere. The atmosphere is not heating the earth. According to the laws of thermodynamics, energy only flows from higher energy earth to the lower energy atmosphere. Earth (oceans and land) heat the air, not the reverse. Where can we measure this effect in the natural world? Detrended (i.e. seasons removed) sea surface temperatures versus air temperatures, we see in the graph below that increasing air temperature ALWAYS FOLLOWS increasing sea surface temperature. No matter how high the CO2 or methane concentrations are in the air, the ocean temperature will control the air temperature of the earth. In bulk, like insulation, water vapor, CO2, and methane temporarily delay but do not halt the continuous dissipation of energy/heat via the process described in the above paragraphs. According to the proposed hypothesis for human-caused global warming (AGW), the continuing accumulation of CO2 in the atmosphere causes or forces increased warming in the atmosphere. The hypothesis requires disregarding the important facts that warming has currently stopped and also that there has been cooling for some periods in our lifetimes and historically, when according to AGW there should have been an increasing rate of warming due to the increasing concentration of CO2. Also, again falsifying the AGW hypothesis, when warming periods have occurred, there is no difference in the rate of warming during those periods despite the fact that CO2 has increased. Based on a single molecule, one CH4 molecule absorbs more energy and re-emits more energy than one CO2 molecule, and one CO2 molecule absorbs more energy and re-emits more energy than one H2O molecule. But, the concentration (or abundance) of water vapor in air is about 1%, while the concentration of CO2 in air is only about 0.04% (or 400 ppm) and the concentration CH4 in air is only about 0.0018% (or 1.8 ppm). Thus more water vapor molecules in the air absorb more IR energy upgoing from the earth. Also, the IR radiation absorption wavelengths of water vapor overlap most of the IR radiation absorption wavelengths of CO2 and CH4. Since the concentration of water vapor is more than 10 times higher than that of CO2 and 100 times higher than CH4, the IR radiation emitted by the ocean, land and sun is more than 10 times more likely to be absorbed by water vapor molecules than by CO2 molecules and 100 times more likely to be absorbed by water vapor molecules than CH4 molecules. Then, when the water vapor, CO2 and CH4 molecules re-emit their energy upgoing and horizontally, or else collide, once again these emissions or collisions are far more likely to be interactions with a water vapor molecule; these phenomena change with increasing altitude. With regard to CO2 and CH4, the net result is that exponentially less warming results from each incremental increase in CO2 or CH4 concentration. The natural logarithm function is the inverse of the exponential function. The graphic below illustrates the natural log curve of temperature versus CO2 concentration that results from progressively increasing the CO2 concentration. In climatology terms, climate and temperature sensitivity are progressively diminished as CO2 concentration increases. Each doubling of CO2 concentration results in incrementally less warming, following a logarithmic progression. The available quantum energy bands of CO2 and CH4 are already occupied with energy received from nearby molecules. Adding more absorbing molecules decreases the mean-free-path of the radiation between molecules. Progressively higher levels of CO2 (and methane) produce progressively less warming. The absorbance of radiation is logarithmic. 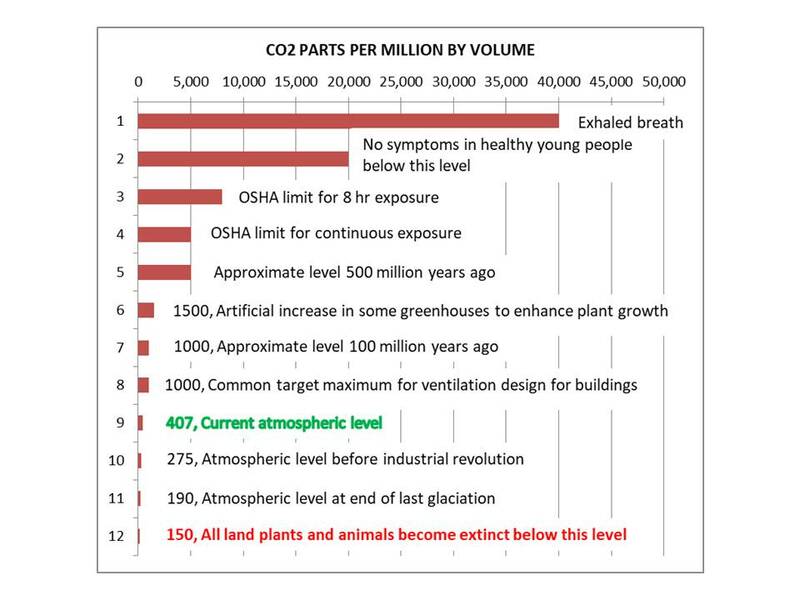 Furthermore, of the approximate 400 ppm (or 0.04%) total CO2 concentration in earth’s atmosphere, humans from all sources emit only about 3% of that total. About 97% of atmospheric CO2 is natural. About 98.5% of total CO2 is absorbed by nature. CO2 concentration has been increasing since the end of the Little Ice Age, around the time of the Industrial Revolution, primarily because earth has been slowly warming since that time. The human contribution is minimal. But, since CO2 is not causing significant warming (or even reproducibly measurable warming), and since the earth is in fact becoming greener according to NASA satellite studies, then there is no good reason to reduce CO2, or to reduce use of fossil fuels. Also, since most CO2 is natural, there is no practical way for humans to significantly reduce atmospheric CO2 concentration. Carbon sequestration, carbon offsets, carbon taxes, carbon trading are environmentally useless, harmful, economically wasteful, fraud. On the contrary, there are benefits to higher CO2, such as increasing crop yields. And there are also benefits to warming. Despite clear evidence that the atmosphere is not significantly warming the planet, and under the laws of physics the atmosphere could not significantly warm the planet, still some politicians and scientists try to alarm citizens to persuade them that increasing CO2 and CH4 concentration forces catastrophically dangerous, large increases in temperature trends by increasing absorption of IR by water vapor. The alarmists’ torturous and unvalidatable hypothesis and models treat water vapor as part of a feedback system rather than as the dominant greenhouse gas. But, if this hypothesis were true, and it is not, since CO2 has been increasing steadily since the end of the Little Ice Age (CO2 increased about 150% from a very low CO2 level), then we should be seeing rapidly rising global temperature due to this feedback forcing effect, and we should be seeing a difference in rate of warming over time (or significant difference in second derivative.) However, the temperature trend has been only slightly increasing, and then only sometimes, and the warming trends are not exceptional or unprecedented in nature, and the overall temperature trend is diverging from the steadily rising CO2 trend. If CO2 were the cause of warming, then the CO2 and temperature trends would be parallel or converging during the same time periods, and the CO2 increasing trend would occur before the warming trend; however, these correlations are not found in real world evidence unless the time periods are cherry-picked or the data has been manipulated. Even worse for the climate alarmists, there are multiple time periods, decades, where the temperature trend decreased while CO2 trend increased…for example the 1960s to late 1970s when most scientists and news outlets were proclaiming global cooling. CO2 cannot force both warming and cooling. Climate catastrophe and gloom are entirely based on computer models, models which have never been validated against scientific observations. Cover of Time magazine, January 31, 1977. Most CO2 is emitted by the oceans and lands, naturally, by degassing caused by the slow warming trend since the Little Ice Age. Warmer water holds less CO2 than cold water. The relative partition ratio of a gas such as CO2 between water and air is controlled by Henry’s Law. Compared to the atmosphere, the oceans contain enormous energy (as already shown). Oceans contain about 50 times more CO2 than the atmosphere and 20 times more CO2 than the biosphere on land. It would take 10,000 years for humans to change the temperature of the ocean by a mere 1 degree even if humans devoted all energy resources full time to that effort. The effects of the oceans on the earth’s climate are enormous, but the warming effect of human CO2 is trivially tiny. The claim that the relatively tiny amount of CO2 contributed to the atmosphere by humans is controlling earth’s temperature is falsified according to the rules of science. We mere humans are not able to change the temperature of earth by adding or subtracting CO2, no matter the amount of CO2. Even if the air were 40% CO2, an amount that is 1000 times higher than today’s total CO2 and 10,000 times higher than the human contributed CO2, the atmosphere can not significantly warm the oceans. Oceans are a gigantic heat sink or reserve, moderating the earth’s temperature and controlling earth’s climate. This is NOT to say that humans do not affect temperature and climate in other ways, such as building cities, roads, planting or cutting forests and fields, etc. This IS to say that AGW, the hypothesis of human-caused global warming by the contribution of a mere 0.004% of the total CO2 emissions, is scientifically wrong. The human contribution to global warming is statistically insignificant, so tiny it is unmeasurable in the real world; the hypothesis of human-caused global warming/climate change has been falsified by real world observations and experiments. Bottom line: the global warming / climate change agenda is a giant, global fraud. The where, why, who, and when proponents knew it was a fraud is a subject for another day and a court of law. The global warming/climate change agenda is a global, political scheme to re-distribute wealth, change national economic systems away from capitalism, reduce national and individual sovereignty and reduce citizen control of private property, and hand over funding and control to unelected supra-national alliances and organizations like the UN and the EU. Figure 12. Sherwood Idso, PhD. http://www.co2science.org and https://thebestschools.org/special/karoly-happer-dialogue-global-warming/happer-major-statement/ Dr. Sherwood Idso with Eldarica pine trees grown in various amounts of CO2 in experiments done about 10 years ago when the ambient concentration of CO2 was 385 ppm. S.B. Idso and B.A. Kimball, “Effects of Atmospheric CO2 Enrichment on Regrowth of Sour Orange Trees (Citrus aurantium; Rutaceae) after Coppicing,” American Journal of Botany, 1994, 81: 843–846. Figure 13. https://www.geocraft.com/WVFossils/greenhouse_data.html Table 4a. 14. Sorokhtin et al. (2007) Sorokhtin, O.G., Chilingar, G. V., Khilyuk, L.F. (2007). Global Warming and GlobalCooling. Evolution of Climate on Earth,Developments in Earth & Environmental Sciences 5, Elsevier, ISBN 978-0-444-52815-5. As with others, thank you for this effort. I meet thrice annually with a group of businessmen to pursue interesting ideas, politics and our own personal development. Climate Change always provokes heated discussion which labor under too little knowledge and amid great certainty. I wanted to take your article, in printed form, as a means of better understanding the issue. Alas, your numerous slides of graphs and data won’t print. Any other way I can get a printable file? Thanks again. thank you for this wonderful article. Being a layman it helps me very much to understand the atmosphere a little bit more. Wondering what is your opinion? Thanks for those kind words and these references. I will review them. I thought your post was well done and requested (in the comments section) some feed back from others at Climate, Etc. It did end up generating some feedback. I really don’t want to start an internet war (I’m just a curious layperson), but would be interested in what you think about some of the comments made about your post above. That said, I totally understand if you don’t wish to do so. People seem to get very defensive, not watch their manners, etc. Thanks for letting me know Geoff. I wrote this by request of some friends who are laypeople. They liked it, so I posted it here on my blog. Of course many technical details are glossed over and simplified. Dr. Curry’s blog is far more technical, of course. I read it, but I missed that post. I will take a look. Thanks. I appreciate very much Dr. Curry’s blog and I have followed it for years. I read that entire thread and all the comments. I do not respond to ad hominem comments such as ‘doom.’ But, for your information, I was trained as a chemist and my entire career (30+ years) was selling, servicing, supporting and managing people who do that in scientific instruments such as gas and liquid chromatographs, mass spectrometers, spectrophotometers, scanning confocal laser fluorescent instruments, etc, worldwide. I have measured the absorption and emission of water, CO2, CH4 etc and many other of their properties using multiple techniques from all the way back to college laboratory classes to putting a gimbled mass spectrometer in a C-130 for NOAA to fly through hurricanes. Title: The Relationship between Atmospheric Carbon Dioxide Concentration and Global Temperature for the Last 425 Million Years. I’ve only gotten as far as the 3rd paragraph, but I noticed few errors. Greenhouse gases also re-emit almost instantly the energy they absorbed, emitting that energy at a slightly lower energy than which it was absorbed. That is incorrect, in two respects. 1. When a molecule of CO2 absorbs a longwave IR photon, it usually does not re-emit that energy as another photon. On average, it takes about one second before it emits another photon, but (at typical temperatures and 1 Atm pressure), only a few nanoseconds before it gives up the absorbed energy by collisional transfer to another air molecule. That means its several hundred million times more likely to loose the absorbed energy by collision with another air molecule, than by re-emission of a photon. That’s why the GHG molecules in that atmosphere stay in thermal equilibrium with the rest of the air. 2. When a CO2 molecule in the atmosphere does give up energy by emitting a photon, it is not “slightly lower” than the energy it absorbed. It might be a bit higher, if the molecule happens to be moving in the direction in which the photon is emitted, causing the photon to be blue-shifted. Or it might be a bit lower, if the molecule happens to be moving in the opposite direction, causing the photon to be red-shifted. But energy is conserved, there’s no loss of energy taken out as a toll by a molecular middleman. Near the equator and bodies of water, swamps and tundra the concentration of water vapor in atmosphere will be near 100%. … Water vapor concentration in air is found in the range of 0% to 100%. Cold air holds very little water vapor. The air at the poles is often very dry. Warm air holds much water vapor. E.g, at a sweltering 40°C = 104°F, a cubic meter of air at 100% RH holds 51.1 grams of water. The cubic meter of air, however, weighs about 1.29 kg. 0.051 / 1.29 = 0.0395, i.e., 3.95% by mass. However, water vapor is only 18/29 = 0.62 the density of dry air, and gaseous concentrations are customarily expressed by volume ratios. 3.95% by mass = 6.4% by volume = 64000 ppmv. Also, you wrote, “The air at the poles is often very dry.” That’s an understatement. The air at the north pole is always fairly dry, because it is always fairly cold. But the air at the south pole is always EXTREMELY dry, because it is always EXTREMELY cold. I only got to your point 1. With regard to your number 1, that is what I said. Higher energy/higher frequency IR (or NIR) is emitted at a lower frequency/lower energy or else it was transmitted transparently altogether. The difference between the absorbance and emission energies is dissipated on molecular motions. Lower energy, longer wavelength IR is dissipated entirely in molecular motions or collisions with no radiation. That is incorrect. The emission and absorption spectra are identical. Sorry. You are mistaken. I have made these measurements myself. The energy differences between absorption and emission are documented in the literature. Please remember that this is not a scientific publication for peer review. It is a general understanding for laypeople. Otherwise I would have posted a long bibliography, and a much longer article and different format is expected. For example, an understanding of the differences between relative humidity (a climate or weather term) as compared to concentration was beyond the needs, intent or message of my article. The point of this article is that the atmosphere as a whole is not controlling the climate, regardless the composition of the atmosphere. Therefore CO2 cannot cause global warming. You still ought to use the correct terms. “Concentration” has a specific meaning. The concentration of N2 is about 78%, by volume. The concentration of O2 is about 21%, by volume. The concentration of Ar is about 1%, by volume. The concentration of CO2 averages about 410 ppmv (0.041%), by volume. The concentration of H2O vapor varies from near zero to about 7%, by volume. That’s incorrect. Weather and climate “happen” in the atmosphere. The temperatures that so many people are obsessing over are air temperatures. So the atmosphere certainly is a part of the climate system, and CO2 in the atmosphere does cause the surface of the Earth, and the Earth’s lower atmosphere, to be warmer than they would be without it. Your comment: “The concentration of N2 is about 78%, by volume. The concentration of O2 is about 21%, by volume. The concentration of Ar is about 1%, by volume. The concentration of CO2 averages about 410 ppmv (0.041%), by volume. The concentration of H2O vapor varies from near zero to about 7%, by volume.” is the same as my article. Sorry, the atmosphere as a whole is not controlling the climate, regardless the composition of the atmosphere. CO2 cannot cause global warming. CO2 is only provides temporary insulation in the lower altitudes near sea level. In upper altitudes, CO2 is radiating into space. CO2 adds no energy to the system. CO2 only buffers or delays the energy emitted from the surface into space. The atmosphere is between 30 and 40 C warmer than it would have been without CO2. I modified the paragraph to include relative humidity. Frankly, I think it makes it more confusing to have both concentration and relative humidity. But, we’ll see what the laypeople say. Here’s the new paragraph: In most locations, the concentration of water vapor (including clouds) in the atmosphere is far higher than CO2 and methane, that is, there are far more water vapor molecules in a given volume of air than there are CO2 or methane. Near the equator and bodies of water, swamps and tundra water vapor in atmosphere will be near 100% relative humidity. That is, the air is saturated, no more water vapor can be added to the air at that temperature and air pressure. Water vapor in air is found in the range of 0% to 100% relative humidity. concentration. Cold air holds very little water vapor. The air at the poles is usually very dry. Warm air holds much water vapor. Air in the tropics is usually humid. And, by the way, a GHG molecule is rarely (i.e. but for 2 moments per day like correctness of the proverbial clock) “in thermal eqilibrium with the rest of the air.” Like the earth as a whole, net net, the GHG molecule is losing energy at night, or during the day, net net, it is gaining energy. The integral calculus would be interesting to model. Equilibrium is a bulk quantity only. Energy stays in motion. Thanks for your intelligent comments. If you would like to edit this, upgrade it, or re-write it entirely, please give it your best. I’d add to it, I’d say: “climate catastrophe and gloom are entirely based on models”. Only a small number of scientists believe that basic model. Only tiny number of scientists ever went over the maths and model in detail. David Evans explains this model in a series of blog posts and criticised it in a paper. He presents an alternative model which explains why the catastrophe model is wrong. Dr Roy Clark gives more fundamental criticisms of the catastrophe model & outlines a better model too. The big problem (and opportunity) we have convincing warmists is they believe on the basis of authority, not evidence. The authority is wrong but its case is rarely addressed, and never presented in detail. Note: “in detail” = count those times when you saw this basic model fully explained to you. In my case, the count = 1 (by skeptic Evans). Why are warmists not presenting their basic model more often? Do they have something to hide? Thanks Mark. Good idea on the climate catastrophe comment. And, yes warmists have a lot to hide. A very nice explanation of how the air/land/sea temperature of the planet works. Technical concepts explained very well, but with a minimum of mathematics. This explains very well the “non-problem” of CO2. Further explanation of how the planet has warmed and cooled over the eons would require delving into astronomical and solar cycles. I hope this writer will take all that on in a follow-on piece written as well as this was. I’ve bookmarked and printed this blog, and will happily pull it out as a Reality Reference for the rational and intelligent people I encounter who only know what they’ve heard from the CAGW crowd. Thanks Ken. I will keep your suggested additional paper in mind also. May I introduce to you, Bud and Can, David Dilley, who is working too on astronomical, solar and lunar cycles in regard to climate. His 2012 article is as great as yours here. Thank you. I will review these. Thanks for reading. Thanks Ken. Let me know if you have or get any questions. Also, don’t miss the science paper linked at the bottom of my article. It’s recent but even more technical. It challenges the AGW crowd to consider a new paradigm.